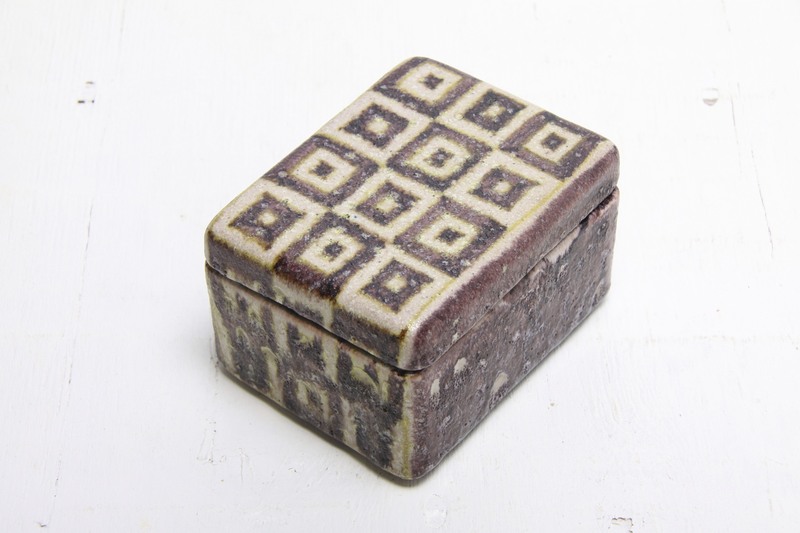 This is a stunning and rare lidded ceramic box by Guido Gambone, Italy circa early 1950’s. 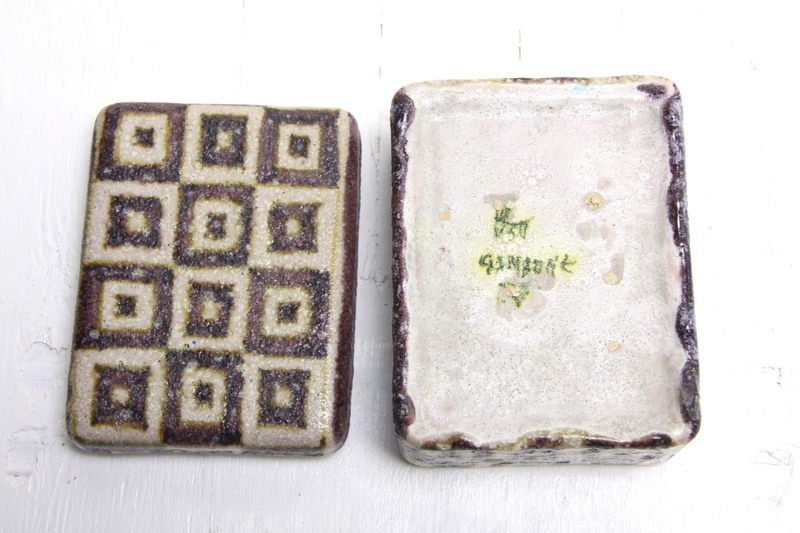 A beautiful piece by one of the greatest ceramic artists of the mid-20th century, showcasing his trademark style. Earthy glazes in brown, green and oatmeal tones are applied masterfully in thick layers, rough and shimmering from added sand and glass, giving an archaic primordial feel. 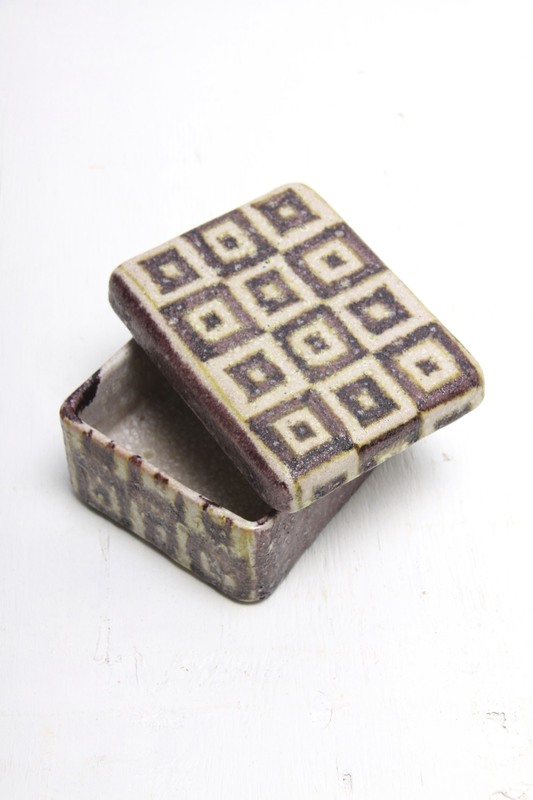 Lovely decor with the geometric pattern continuing and matching over the lid and sides of the box, the box has a simple rectangular lidded form, perfect for display or use on a desk, side table, mantelpiece etc. Would make a fantastic addition to any collection of Gambone / Italian / art pottery, 20th century art / design and would complement any retro, vintage, mid century, modernist, minimalist or contemporary styled interior. Hand signed to the base with the hallmark painted donkey motif. In excellent condition, the exterior and interior of the box is all perfect, the inner rim of the lid has a few glaze flakes and a couple of chips on the very inner rim, not noticeable and do not detract. More photos are available on request, please enquire if you have any questions.